This one’s a biggie: after ten years as the wine director of ~THE DINING ROOM AT THE RITZ-CARLTON~, Stephane Lacroix is resigning and moving to New York. 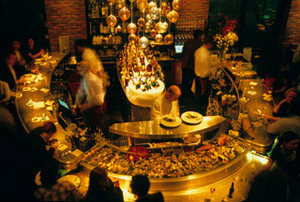 He is going to be the GM at Gilt, the luxe restaurant in the New York Palace that earned two Michelin stars this year. While Lacroix is sorry to leave, he is looking forward to the challenge of a new position in a new city. His last day at the Ritz is February 20th. His wife Estelle, who many may remember from Myth, is excited about the move to New York, and is currently interviewing for a position. Best of luck to this lovely couple; thank you for all the years of your oh-so-classy hospitality. ~JOHN COLINS~ has finished its move from its Natoma address to a new location in SoMa on Minna (the Transbay Terminal construction inspired the new address). The vibe and offerings are the same, so the only significant change is that it’s a couple blocks away from where it used to be. Is it happy hour yet? Just in case you’re wondering about the new bar called ~THE RESIDENCE~, it’s the latest incarnation of the former Amber space. The cozy-eclectic look is more study than smoking lounge (that’s right, no more puffing away while at the bar, darlings), with a refreshed cocktail list, comfy seating, and clever sconces made from old globes, plus wallpaper and wood paneling. But one thing remains the same: it’s still cash only. ~WATERBAR~ has updated its popular happy hour offerings, renaming it the “Come Unhinged!” Happy Hour. It runs every Monday through Friday from 3pm-6pm, with $5 specialty cocktails, $5 glasses of La Marca prosecco and Nick’s Cuvée pinot grigio, and $3 bottles of Session Premium Lager, plus the featured oyster of the day for $1 (available from 11:30am-6pm daily). There are also some new items on the bar menu, like smoked sturgeon chips and dip ($9); Van’s shrimp taco with handmade tortillas and fire-roasted salsa ($7 each); and a wood oven pizzetta with oven-roasted tomatoes, balsamic onion, and arugula ($11). 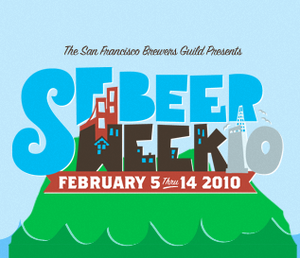 Upon my return home from India, I took a peek at the lineup of events for ~SF BEER WEEK~ and was completely blown away. The schedule is hefty—read it and prepare to get thirsty. And hungry. There’s a lot to choose from, but here are some that caught my eye: the Beer & Nosh dinner at Scala’s Bistro (check out the menu here); Humphry Slocombe beer ice creams all week; 4 Chefs, 2 Breweries, 1 Dinner: Magnolia & Dogfish Head at Bar Tartine, with some Chez Panisse crew joining Chris Kronner in the kitchen; A Beer vs. Wine Valentine at Bar Crudo, a five-course dinner facing off beer and wine pairings for each course; the Beast + Bavaria dinner at Orson; and the Oyster Fest at Magnolia, featuring oysters that have been shucked, BBQ’d, Rockefeller, in chowder and a Hangtown Fry, and even rocky mountain oysters—and there’s also a beer and pastry tasting at Thorough Bread. Seriously. Buckle up. 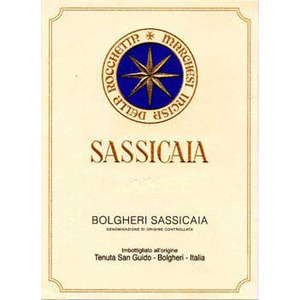 Mmmm, Sassicaia. Here’s more from ~SPRUCE~ on this sure-to-be-super (Tuscan) dinner: “Sassicaia translates to ‘a place of many stones.’ The rocky vineyard is located at 80 meters altitude and is the label responsible for creating the Super-Tuscan movement. For the first time in Italy’s history a DOC was created solely for one estate. Bolgheri was formed in 1994 to recognize the planting of Bordeaux varietals in Tuscany.